Hand made in England from soild brass lamp complete with glass Collie 25cm cream shade. Hand made in England from soild brass lamp complete with Collie 20cm acid etched white glass shade. The Kolarz Ascot 0195.42.4 is in an antique brass finish with Murano glass detailing and a cream shade. The Elstead Balance Floor Lamp is a modern standard lamp in a White and Polished Nickel finish with a bottom diffuser. The Franklite SL230 Floor Lamp is in a Matt Black and Chrome finish with an off-white shade. The Franklite SL234 Floor Lamp is in a Bronze finish with a fully adjustable head and integral dimmer. The Franklite Campani Standard Lamp is in a Brushed Bronze finish. The Cupid Floor Lamp is in a tripod design with an intricate bird-cage shade in a Copper finish. The Oaks Delta Standard Lamp is in an Antique Brass finish with an integral dimmer. Hand made in England from sold brass lamp complete with glass Coolie 25cm & 30cm acid etched white shades. The Elstead Gibson Floor Lamp is in a Cambridge Crackle finish. The Elstead Gibson Swing Arm Floor Lamp is in a Cambridge Crackle finish. The Franklite SL233 Floor Lamp is in a Gold finish with a fully adjustable head and integral dimmer. The Franklite SL228/1172 Floor Lamp is in a Grey finish with a Black marble base and a Silver Grey shade. 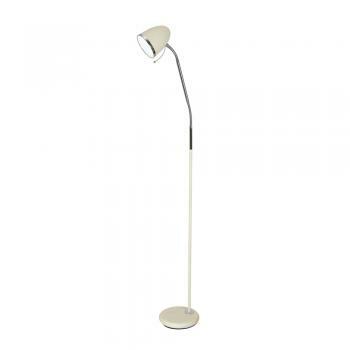 The Mimax Hannah floor lamp is a modern, lacquered White finish standard lamp. The Oaks Hermer Floor Lamp has a blown glass body and a fluted square fabric lampshade. The Oaks Jack Floor Lamp is in a Black finish with a flexible head and a foot switch. The Oaks Juma Two Headed Floor Lamp is in an Antique Brass finish. The Oaks Juma Two Headed Floor Lamp is in a Black Chrome finish. The Oaks Lastur Standard Lamp is in a Soft Grey finish with a matching fabric lampshade. The Laura Crystal Standard Lamp is in a Gold finish with a criss-cross shade set with a myriad of sparkling crystal balls. The Franklite Lutina Floor Lamp is in a Bronze finish with Satin White glass shades. The Oaks Madison Floor Lamp is in Black with chrome trim. The Oaks Madison Floor Lamp is in Blue with chrome trim. The Oaks Madison Floor Lamp is in Cream with chrome trim. The Oaks Madison Floor Lamp is in Dark Grey with chrome trim. We offer a vast selection of floor and standard lamps to choose from. Whether you are looking for a functional floor lamp to read by or want more of a statement piece to create a talking point in your room we have something to suit you. These quality floor lamps are available in many designs, modern and traditional styles and various finishes.